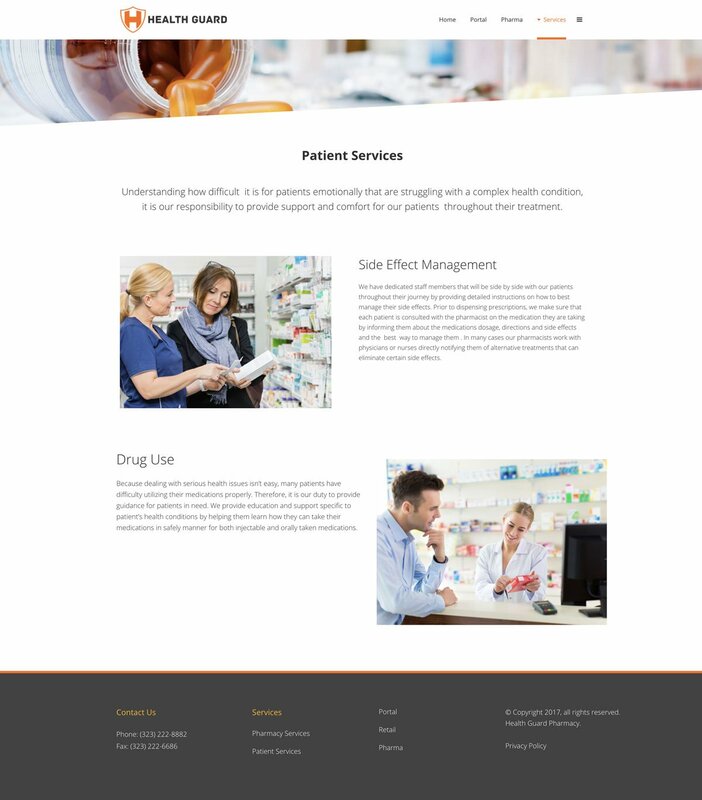 As a professional service provider in the healthcare industry, the Health Guard Pharmacy needed to present a polished, professional brand identity. We focused on a clear, strong presentation of minimalistic graphics. The logo was the very first piece of the puzzle for our Health Guard Pharmacy project. We presented the client with several different logo mockups. Once they selected their favorite option, we were ready to move on to the next steps in the design process, using the logo as the basis for our work. 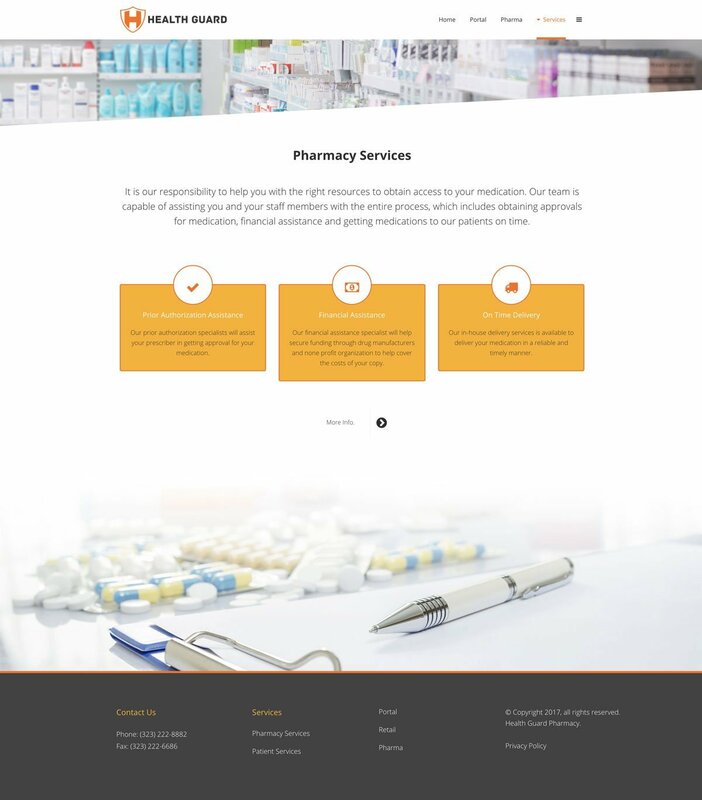 Though much of our work for Health Guard Pharmacy focused on the digital realm, business cards and presentation folders are still an important part of the way businesses present themselves. These graphics used the orange logo color in an abstract gradient for a look that projects competency. Above all, we stayed focused on the need to balance professional design with mobile-friendly formatting as we created the client’s website. Our goal was to integrate cutting-edge web development techniques to provide a responsive experience for the client’s site visitors no matter what kind of device they used, increasing our client’s reach and providing a polished browsing experience. 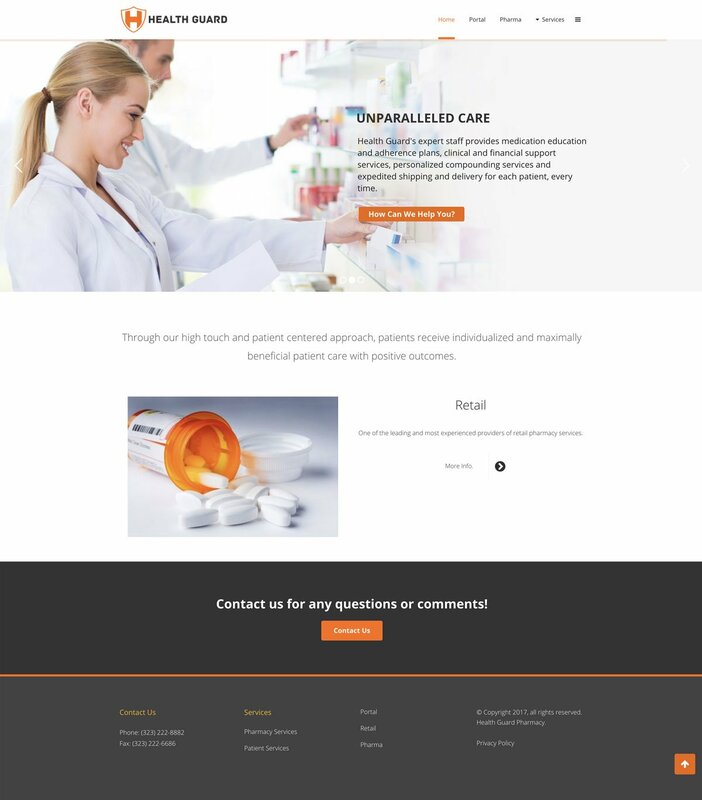 The finished product for Health Guard Pharmacy is a distinctive and fresh brand identity and website design that hits all the right points for aesthetics and technology. The website is easy to navigate, with a clear layout and easy-to-understand menu system that allows site visitors to get the information they’re looking for with ease. The visual elements of our design work are just as crisp and stylish, showcasing a modern aesthetic sensibility that symbolizes how innovative and successful the client’s business is. The use of orange connotes a sense of importance that’s fitting for Health Guard’s industrial context, and our shield logo further displays strength and dependability to establish the company’s brand. While black and white form the foundation for the brand identity color scheme, orange provides the perfect eye-catching accent both on the web and in the company’s presentation folders and business cards.